– This is a neon polish and I am quite loving the colour! A bright blue is perfect for summer (my picture is not doing it justice!). There is a slight shimmer to this polish. – All I can say about these shampoo samples that we receive in these beauty boxes is that they are great for travelling lol. This one has a nice floral scent to it. – I have not heard of this brand before and masks are always nice to try. This one is made with all natural ingredients and is suppose to “relieve irritation and redness while cooling and firming the skin.” It definitely smells like cucumber. Looking forward to trying this on my skin! 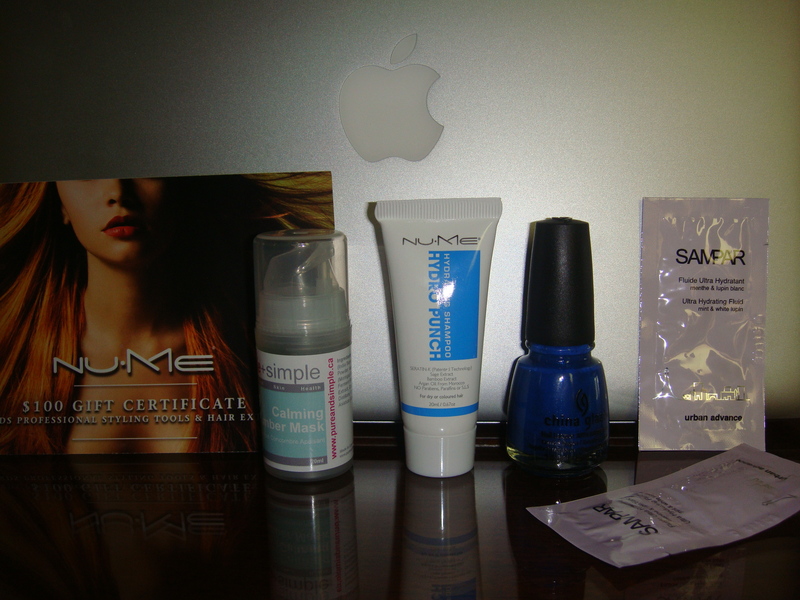 – I discovered the first 3 products and wondered if that was all that was included in this month’s box. Then I looked at the description card and saw that another product was included. However, my first thoughts were, where is this product?! I shook the box thinking that maybe they forgot to include this sample. Then I looked at the stack of paper cards included and realized that the Sanpar samples were there (two of them). I was kind of disappointed because I expected a “deluxe” size sample for this product. I will still try this sample out, but I feel that you don’t really get to experience it fully when you only try a product a couple of times. Overall, this was a decent box and I do look forward to next month’s. I would love to see more makeup products in future boxes! August 2012 Topbox « take her word.